The amaryllis, or hippeastrum, is a common bulbous plant with colorful lily-like flowers and long stems that blooms even during the winter. These plants can be cultivated successfully in gardens and pots. With proper care, an amaryllis will continue to bloom every year between late December and late June. The amaryllis was cultivated as early as the 18th century. Typical amaryllis plants can grow up to 23 inches tall and produce blooms approximately 4 inches in diameter. Each stalk can produce between two and 12 flowers. While the most common amaryllis is the single-bloom variety, double-bloom and miniature Japanese hybrids are prevalent, too. Common bloom colors include red, white, pink, salmon and orange as well as striped varieties that combine red or pink with white. The flowers can be planted in a container with drainage holes that is heavy enough to support a plant that produces large flowers and large enough to leave a 2 inch space between the bulb and the pot's edge. Soak the base and roots of the bulb in lukewarm water for several hours prior to planting. Choose a potting compost and plant leaving the top third of the bulb and the neck exposed. Press the soil around the bulb firmly. A general bulb fertilizer can be placed under the bulb. The flower might need a support stick between the bulb and the pot's edge to support the stem. Amaryllis plants can be planted outdoors starting in June. The plants prefer to be pot-bound rather than transplanted. Planting the bulb in its pot keeps the amaryllis safe from insects. 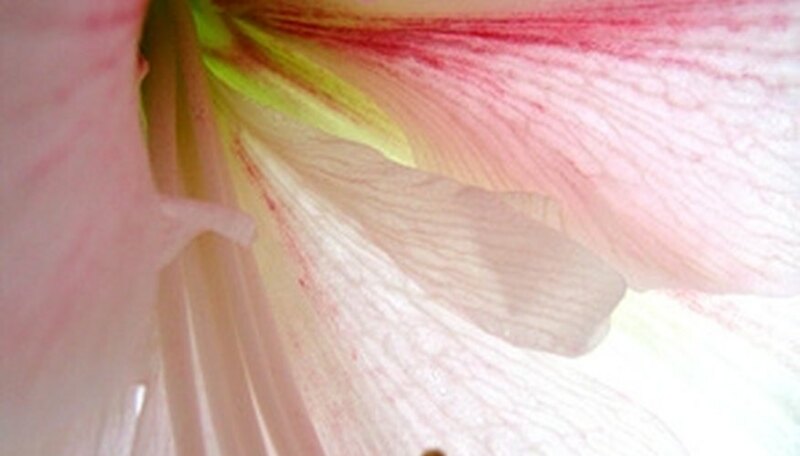 Choose a sunny location and water and fertilize the soil, then plant the amaryllis in its pot. Bring the plant indoors before the first fall frost. Amaryllis plants, whether in pots or outdoors, need warmth and direct sunlight. Water the bulb once thoroughly and then only once a week thereafter from the bottom of the pot if possible until the stem appears. Overwatering at the beginning of the plant's growth is the main cause of rot and failure. Once the stem appears, water whenever the surface of the soil is dry but no more frequently that every three days. When the plant flowers, move it to a shaded spot to prolong the bloom and return it to direct sunlight once the bloom has withered and been removed. The plant should be watered and fertiized during the summer, with blooms removed as they wither. When the leaves begin to yellow in early fall and the stem begins to sag, the stem should be cut back to the top of the bulb. Place the potted bulb in a cool (40 to 50 degrees) and dark place for six to eight weeks. Do not water the bulb while it is dormant. Begin the forcing process anew by replacing the top half-inch of soil in the pot, watering the bulb once thoroughly and placing in a warm and sunny spot. Water sparingly while waiting for the stem to reappear.